When: Saturday, November 9th. Full schedule is below. Arrive 30 minutes before your performance time. 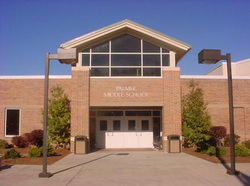 Where: Palmer Middle School. Click here for a map. Attire: Official Dodgen Band uniform - Band shirt, black pants, black socks, black shoes. What to Bring: Instrument, music, and a pencil. Remember to bring your instrument and music home from Dodgen Friday after school! Click Here for the written information about all upcoming morning ensemble events! Click Here to complete the Ensemble Performance Confirmation form! You may report directly to the warm-up room, bypassing the registration table. Mr. Jeffres and Mr. Westphal will handle the registration process. If things are running on time, we will be done just a few minutes after your performance time. Thank you for adjusting your busy Saturday schedules to attend! Remember, each group is highly dependent on EVERY member attending.